Happy New Year, everyone! I'm back in Toronto and feeling guilty about not having done any school work over the holidays, so you probably won't hear from me again until next week. I mean, unless I'm procrastinating instead of studying for that final exam I have on Friday. At any rate, I'll post all sorts of pictures from Christmas and whatnot soon enough. Ok, it seems like a stupid idea, I guess, to crochet a fake cake. 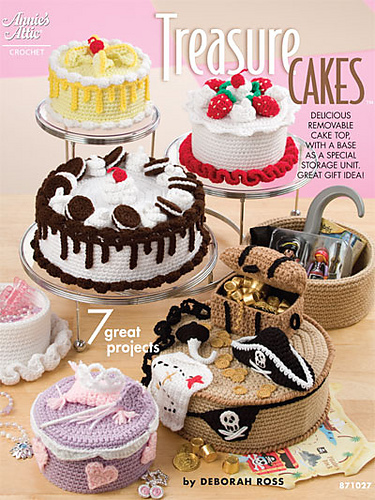 I mean, What Not to Crochet has dissed crocheted cakes again and again and again. I would say that excessive doesn't even begin to describe these. But... but... you can hide things in them! And the designs are so precious! They look good enough to eat! The book is not yet available, and I'm seriously debating whether or not to pre-order it, but then again it won't be released until April, and I have a short attention span. Edit: Ok, so I was wrong. It'll be released on Jan. 29th, so that's not quite as long to wait. Also, Deborah Ross's site is called Four Bees Design, and you can read all about her and her designs there.